This fun neckerchief slide would be a good one to do for the boys for the Blue and Gold Banquet. I originally found these cute "bottle cap images" on a site for sale. I bought them, and printed the sheet of 12 "bottlecaps" on a size 5x7 glossy photo paper, cut them out and put a back on them made out of 1/2" PVC pipe. They did not cost much, and are a cute and easy neckerchief slide. The company stopped selling these bottlecaps, so I made some of my own. Click here to go to the page where I have them ready to download. Click here to go to the blog post where you can print your own. Click here to see all the blog posts that have bottle caps that are available on our blog. My original plan was to make them with the glass stones, and printed them 5x7, but that made them a little too large to do them that way, so I just put a back on them. I really quite like them. They are cute and cheap! The company stopped selling these bottlecaps, so I made some of my own. Click here to go to the page where I have them ready to download. If you want to learn how to do the neckerchief slides with the glass jewels, I have put that tutorial on our district site. AlpineDistrictCubs.blogspot.com. Click here. The company stopped selling these bottlecaps, so I made some of my own. Click here to go to the page where I have them ready to download. This would be an easy neckerchief slide to do for fall or Thanksgiving. We ordered these fuzzy magnets from Oriental Trading, colored them, put backs on them, and they were done. They were quick, easy, and cheap! The Theme for January is Abracadabra and the Core Value is Positive Attitude. The neckerchief slide idea for the month is to make bunnies coming out of a magicians hat made out of felt and fun foam. Enjoy! Print this PDF onto cardstock, and cut out all the parts. Trace onto stiff felt (I used glitter foam for the red strip). I also used a pencil to trace onto the black felt and it worked! Glue them together with a glue gun making sure the pen marks are on the back. If you choose to put on eyes, the wiggly eyes I used are 8mm size. I used sharpie markers to color the faces, and on one I also used a pink sharpie to color the ears. Attach a back to the neckerchief slide. I like to use 1/2" PVC pipe cut into small strips. The Theme for December is Holiday Lights and the Core Value is Respect. 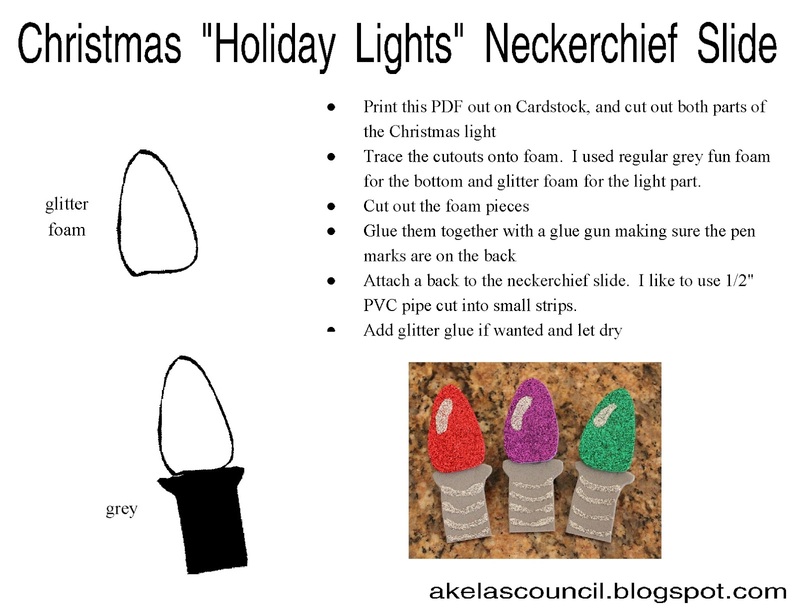 The neckerchief slide idea for the month is to make Christmas Lights out of fun foam. Enjoy! Print this PDF out on cardstock and cut out both parts of the Christmas light. Trace the cutouts onto fun foam. I used regular grey fun foam for the bottom and glitter foam for the light part. Add glitter glue if wanted and let dry.